Over the course of the last couple of weeks, the kiddos and I have read through the book, Harry Potter and the Sorcerer's Stone by J. K. Rowling. Once we were finished with the book, I couldn't resist designing a unit study to go with it. The kiddos have absolutely loved our Harry Potter and the Sorcerer's Stone Unit. They can't get enough of it. This has seriously been the best Halloween themed unit ever! The Mirror of Erised showed people what they desired most. During learning time, our mirror showed kiddos how to read and spell words. 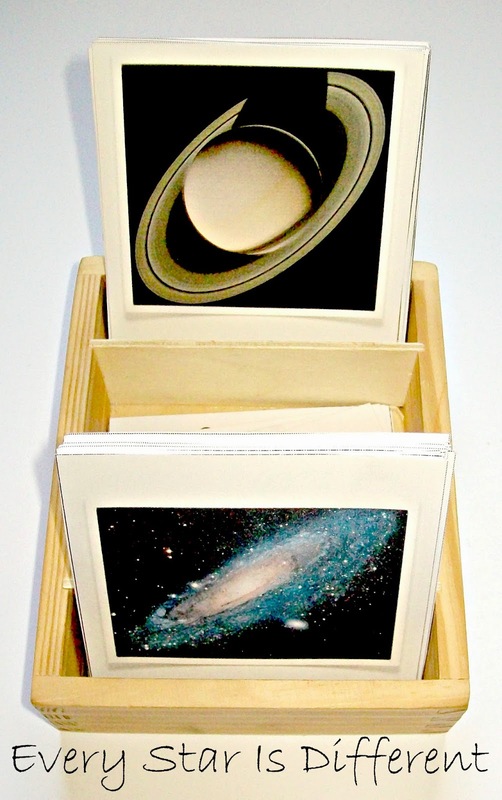 To make the cards for this activity, write a word on a card or piece of paper. Hold it up to a mirror. Note that it's backwards. Using something to write with, copy the backward image on another card. This will be the card you use for the activity. When you hold the backward word card up to the mirror, the word will appear correct. Once the kiddos could see the word and correct spelling in the mirror, they were asked to write it on the mirror. I chose VERY easy words so that all could read them. After they wrote the word, they could draw a picture also. Taking the activity a step further, I provided a tray with a rag and glass cleaner, so they could clean the mirror off, preparing the activity for the next person when they finished. It's one thing to try making potions, but yet another to count how many times they work. 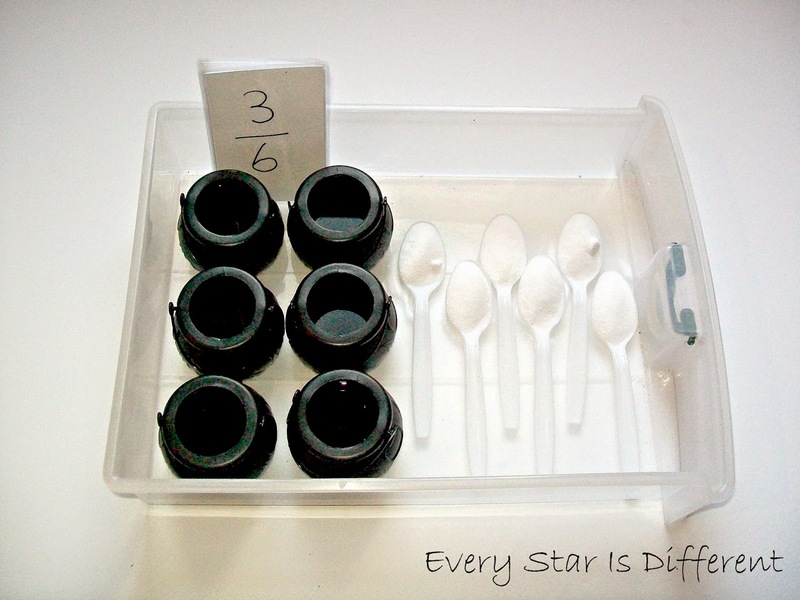 In this activity the kiddos keep track of how many times their potions explode into magical colors. Once they've tried every cauldron, they choose the fraction that best fits their trial and error process. 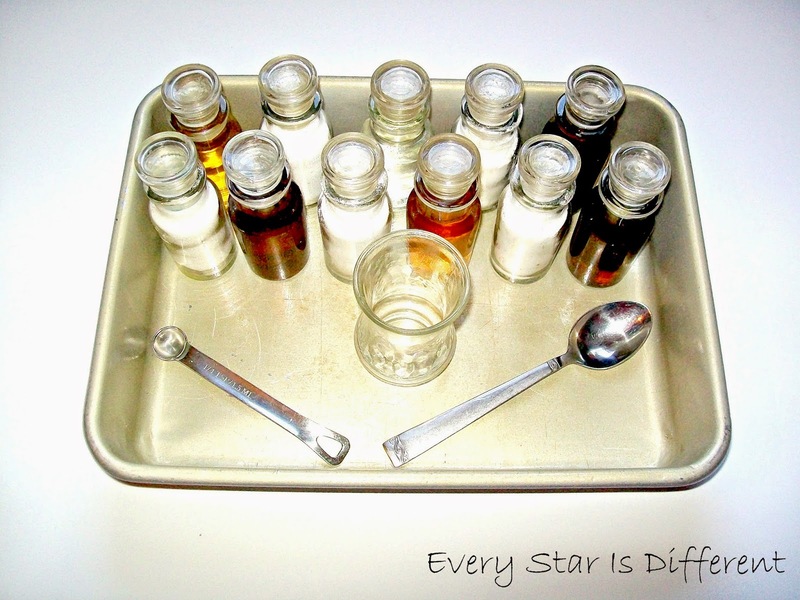 To prep this activity I poured vinegar into some cauldrons and water in others. Then I added a few drops of food coloring, making it a little more fun. The kiddos scooped baking soda out of a container and added a heaping teaspoon to each cauldron. Those with vinegar exploded with color. Those with water did not. 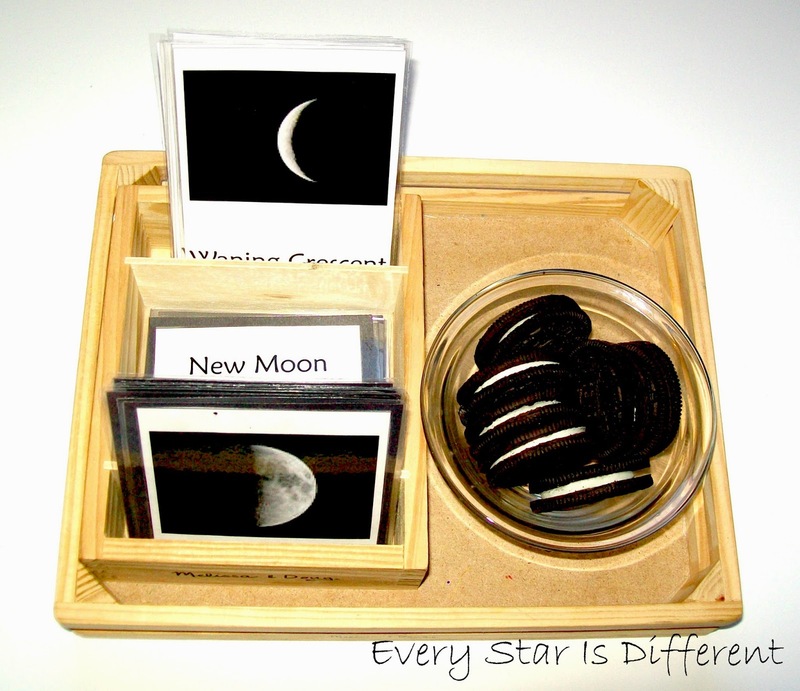 We've done this moon cycle with Oreos activity before on a few occasions, but it never hurts to review, especially when applicable. It's mentioned in the book that Harry had to study Astronomy at Hogwarts. Source: The free printable for this activity can be found at Noon Janan Homeschool. 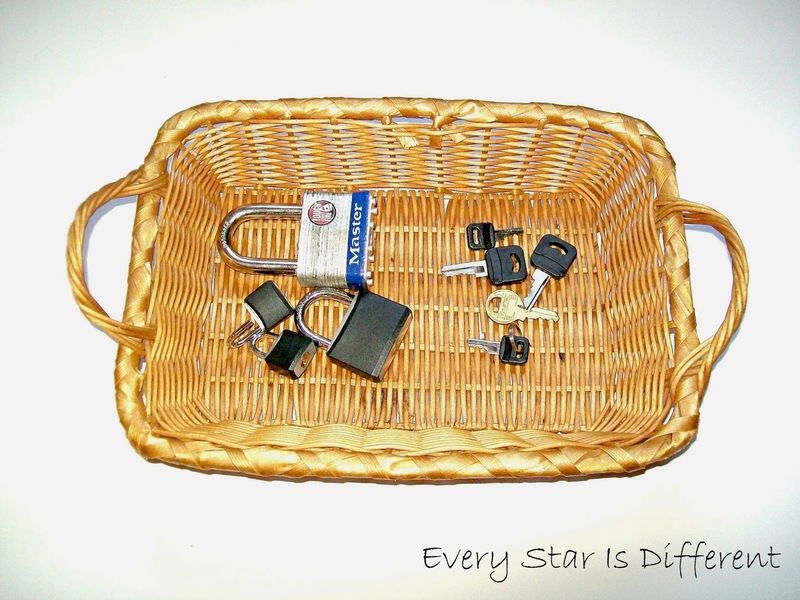 Once again, we've done this activity before, but I thought it a perfect time to review. We find learning about the planets so fascinating. 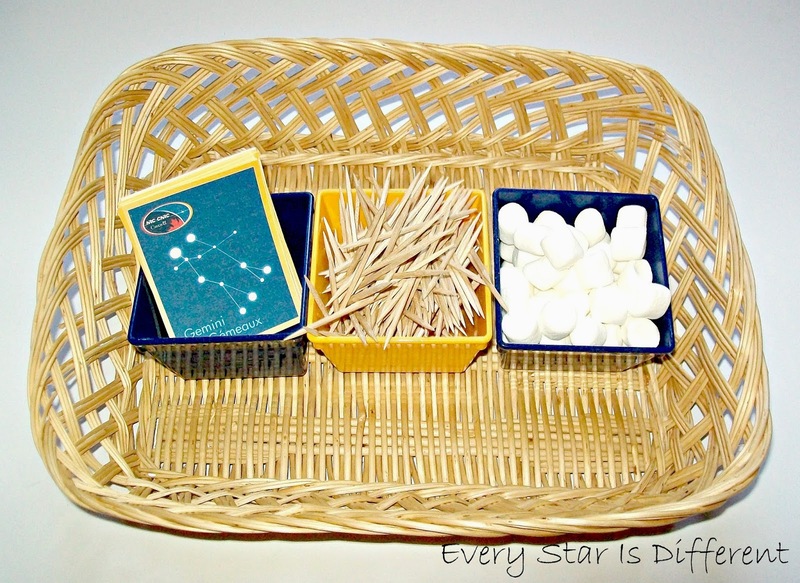 Learning about astronomy wouldn't be complete without reviewing some constellations using toothpicks and mini marshmallows. This activity has always been favorite! 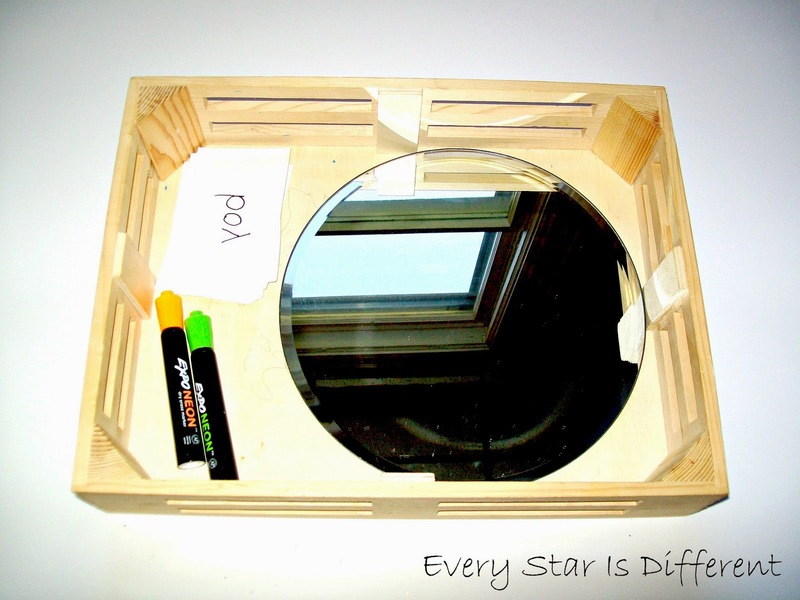 Source: The free printable for this activity can be found HERE. I originally saw the printable at Counting Coconuts. This activity combines practical life and science. It was by far, one of the most favorite activities on the shelves this week and boy did it STINK! Surprisingly the kiddos did okay with this, as they remembered the book mentioning that Snape's potion lab also smelled quite horrible. There were many purposes in designing this activity the way I did. Besides practice with scooping and pouring, it was a review on liquid density. It was also an introduction to solutions and mixtures. The kiddos were asked to invent their own potions using the materials provided. I purposely made sure that they did not know what any of the ingredients were, so that they would have to discover for themselves which ingredient did what. Little did I know exactly what this combination of ingredients could do. There were sparkling layers that bubbled and fizzed and exploded. It was FABULOUS! So what did I use? Only what I had in my kitchen. The activity was definitely worth the smell! As we've been reading the first Harry Potter book, the kiddos have all asked for magic wands at one point or another. I was thrilled to find a fabulous way to pull this off at minimal cost. 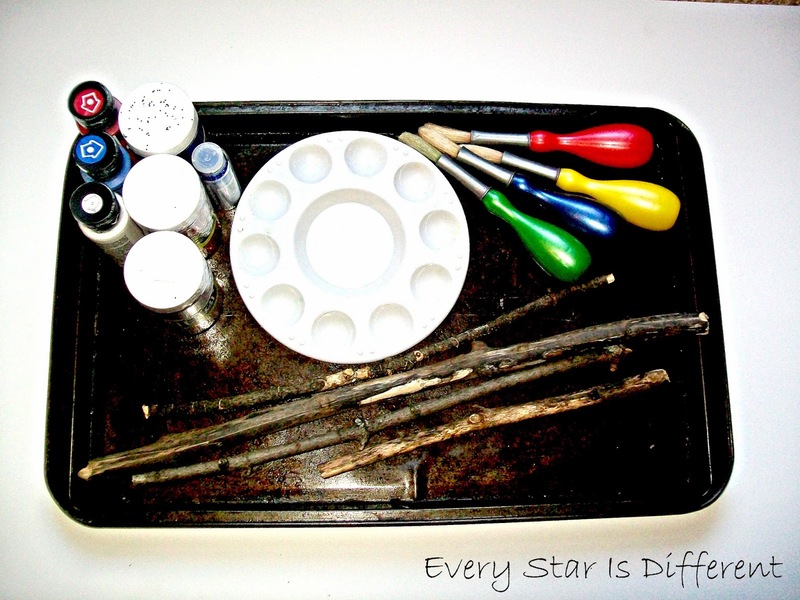 The kiddos all chose sticks out in the yard for their wands. This week we painted them and sprinkled them with glitter. Finding the right key is a big deal for Harry Potter. I thought we'd practice too. 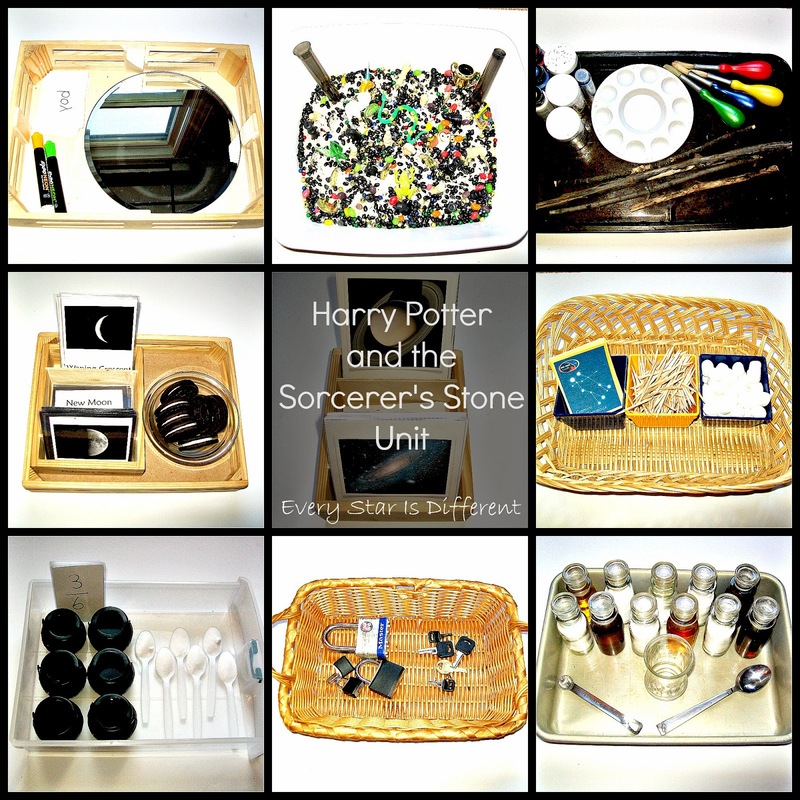 When asking Dinomite what he wanted included in this unit, he immediately said he wanted a Harry Potter Sensory Bin. He even went so far as creating Harry Potter, a Dumbledore, and a few other characters out of LEGO parts for me. 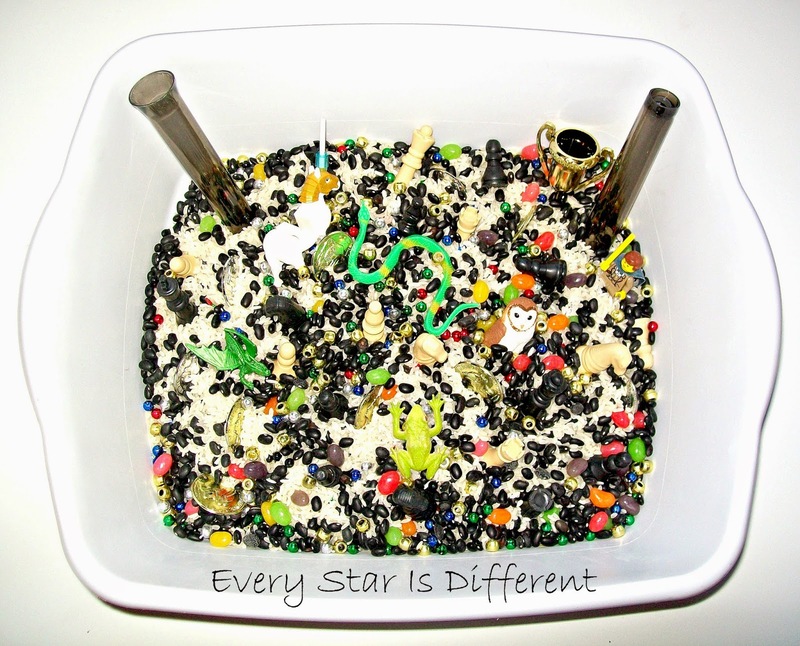 Our sensory bin included the items below, all of which we already had at home. The bin has been a big hit! To end our fabulous Harry Potter study we had our annual Witches & Wizards Halloween Party and watched the first Harry Potter movie, skipping over the scary parts. Everyone enjoyed themselves. 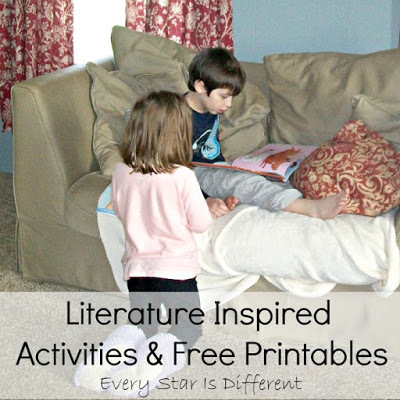 If you're looking for other literature based units, check this page out! these look amazing. I hope the kids continue to enjoy the books. My kids have enjoyed them. What amazingly awesome ideas! We've already done a Harry Potter unit but we may just go back and do another one!